His executive order is full of loopholes designed to protect Wall Street and multinational corporations—at the expense of American workers. There is a good argument to be made for so-called “Buy American” initiatives. Done right—as part of a national industrial policy that embraces smart regional development and fair-trade protections—they can play a real role in creating sustainable, long-term prosperity. Unfortunately, Donald Trump is not doing it right. His combination of crude nationalism and failed conservative economic calculations makes “Buy American” into a bumpersticker slogan on the back of a truck that is hurtling toward the economic low road. During Tuesday’s swing into the historic Midwestern manufacturing city of Kenosha, Wisconsin, Trump restated the promises of his 2016 campaign without really taking action. It was a full-on populist spectacle. The president even brought along White House “strategist” Steve Bannon—the master manipulator of messaging for the Trump campaign who, despite the “palace intrigue” gossip of the moment, remains the populist puppeteer in the Trump White House. 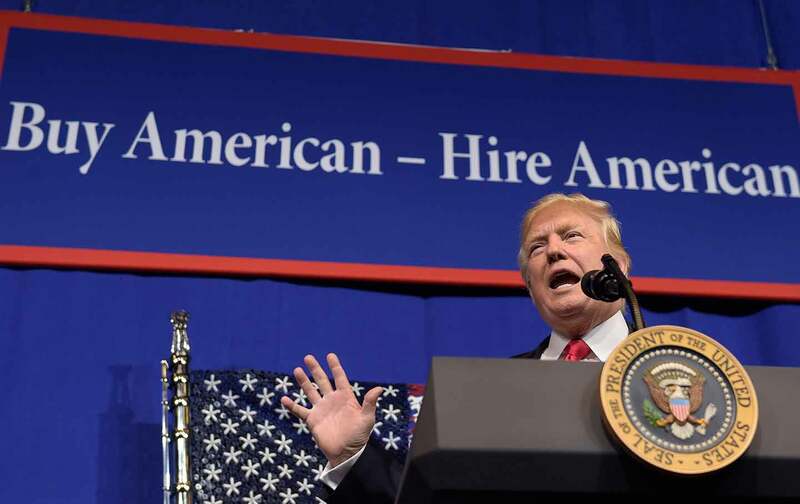 The main act was Trump’s signing of a much-heralded “Buy American, Hire American” executive order. But it was mostly theater. As with Trump’s campaign promises, the executive order is full of loopholes that are designed to protect Wall Street interests and multinational corporations—at the expense of American workers and communities. The biggest of those loopholes involves the fact that dozens of countries currently get waivers that allow them to avoid following “Buy American” policies. When he claims to be making major moves but instead tinkers around the edges, Trump deceives voters who trusted him. Baldwin and Merkley asked the Trump administration to suspend waivers that allow foreign firms to get around ‘Buy American’ requirements until fairer procurement agreements are negotiated. “You promised the American people a ‘Buy American, Hire American,’ trade policy. This report makes clear that our manufacturers are losing out in our trade deals. We are calling on you to honor your commitment by suspending Buy American waivers for foreign firms until government procurement chapters in our trade agreements are renegotiated. Absent such action, every government contract your administration signs risks sending hardworking Americans’ tax dollars abroad. Removing such terms from agreements such as the North American Free Trade Agreement (NAFTA) is an important step to trying to reverse our large trade deficits and provide more demand for US made manufactured goods,” the senators wrote in March. Despite such talk, however, Trump appeared in Kenosha surrounded by Republican operatives and officials, a number of whom have for years sided with multinational corporations rather than workers in trade debates. Trump’s “Buy American” executive order is full of loopholes that are designed to protect Wall Street interests. Where’s the disconnect here? That’s easy to explain. Trump has never been serious about the trade and procurement policies that he made central to his campaign. He has never tried to familiarize himself with the basic steps that could be taken to make good on his campaign promises. The ineptness with which most media outlets cover debates about trade and industry has allowed Trump to avoid scrutiny during the campaign—as did the excuse of ignorance. But the campaign is over; Trump is president. At this point, when he claims to be making major moves but instead tinkers around the edges of the issues involved, Trump deliberately deceives voters who trusted him. Trade and procurement policies should be reformed—not with the purpose of isolating the United States but with an eye toward forging agreements that benefit workers, the environment, and human rights in all countries. Industrial policy and planning should be embraced so that haphazard development policies do not leave American communities and whole regions behind—and so that the United States can finally begin to prepare for the future without resorting to the crude xenophobia, crony capitalist corporatism, and political gamesmanship that continues to characterize Donald Trump’s approach to vital questions of how the United States will engage with a changing and challenging world.